The global market for giant earthmover tires has, at certain times, made the gold market look like a pillar of stability. That’s not the case lately, with off-the-road (OTR) tire distributors and trade organizations predicting continued flat demand as producers cut back on project plans, auction off unneeded fleet assets and reduce on-site inventories. Increases in earthmover tire production capacity—such as the start of production from Michelin’s new plant in South Carolina last year—also have helped to straighten out kinks in the supply chain and, although scattered instances of scarcity in certain sizes of tires may occur from time to time due to industry developments, buyers generally can find adequate supplies of the tires they need. The equilibrium in the global giant earthmover tire market could also be a boon for improved fleet-related safety and performance; with customers currently able to find and buy the correct tire model for site requirements, there’s no scramble—as there was during tire-shortage years—to find any kind of tire that would fit just to keep a fleet running, often with unfortunate results in service life, safety and maintenance requirements. The past tire shortages did serve to focus fleet operators’ attention on the importance of proper tire maintenance. Although the costs involved in buying, maintaining and disposing of giant earthmover tires can seem astronomical, tire maintenance itself isn’t rocket science. In talking with several OTR experts, E&MJ found that even though details may vary from company to company and site to site, the basic elements of a good tire maintenance program stay remarkably consistent. Maintain Operational Awareness–achieving maximum tire life is a joint effort—operations, maintenance, and servicing dealers need to work together to educate end users, address areas of concern in the operation, and specify the best product for the application. Maintain Proper Pressure–maintaining optimum air pressure helps ensure tires operate to their design capacity. Under or overinflation has been demonstrated to negatively impact tire life. Use Tire Pressure Monitoring Systems (TPMS)–access to real-time temperature and pressure data enables the end user to optimize tire performance within the safe operating limits provided by the manufacturer. Action can be taken to address any overheating or underinflation issues as they occur. Properly managed, these systems prevent premature failures. Savings in tires can outweigh the cost and maintenance of the system. Do Routine Tire Inspection–regular, proactive tire inspections can provide early detection of repairable damage, stone drilling, tire deformation that may lead to premature failure, uneven wear patterns, etc. A proactive inspection program would be coupled with actions to address areas of concern. Rotate Front Tires–part of an overall tire management strategy, a defined rotation program not only ensures an adequate supply of spares for rear fitment, but also optimizes safety, tire wear and tire life. Do Repairs–even with the cost of repair included, a quality repair program can increase the fleet scrap average and reduce overall tire-related costs. Regular tire-tread inspections and pressure checks are essential to optimize tire service life. In addition to these practices, other steps can lift a tire-maintenance program from adequate to superior, said Bennett. These include establishment of Tire Performance Improvement Committees (TPICs) that promote joint focus by all parties aimed at maximizing tire life through implementation of continuous improvements and best practices; and methodical data collection and analysis to identify trends and take action to maximize tire performance on site and minimize overall tire-related costs. There are a number of tire tracking systems on the market, Bennett pointed out, and most are aimed at collecting the same basic information to enable historical data and analysis to identify trends and help make decisions. Likewise, the numerous TPMS systems on the market also focus on similar data—real-time contained temperature and pressure information. True value can be found in systems that provide easy access to current data (dashboards), integration with customer systems (SAP, Modular, etc. ), forecasting and proactive maintenance planning (work flow and manpower). Johni Francis, global product manager for Titan Tire, listed similar tire-program elements and offered some additional recommendations for maximizing tire service life and improving a mine’s overall tire maintenance program. Tire life can be extended by training truck operators to adopt proper driving habits: e.g., avoiding excessive dynamic braking and “static” steering, during which the front wheels are turned while the truck is standing still; avoiding debris on the haul roads and promptly notifying the dispatcher when road-surface problems are observed. To ensure the success of a site’s tire management program, both production and maintenance groups must be “on the same page,” Francis noted, and drivers must be made to realize the importance of pre-operational, walk-around tire inspection, frequent pressure checks, and just “being observant” of tire and road conditions. Bennett said OTR tire manufacturers continually invest in research and development (R&D) to improve tire design—but most design innovations aren’t obvious to the naked eye. Recent improvements have focused on heat dissipation, involving features such as cooling fins on the sidewall, better air flow through the grooves in the face, and different materials or methods of construction. Concurrently, manufacturers continue to seek new solutions for specific applications in which high-wear rate, traction, distance or speed are key concerns, because when it comes to tire selection, choosing a tire that best fits site haul distances, speed and truck Gross Vehicle Weight often requires compromise in performance characteristics. 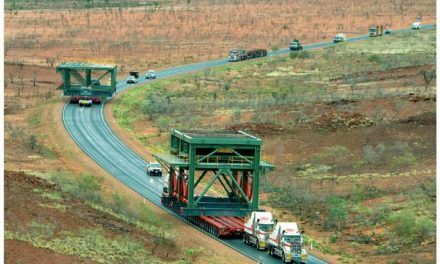 The selection process can be facilitated by employing tools such as weight studies, VBox (GPS tracking and telemetry), volumetric load scanning and TPMS system implementation. Titan Tire’s Francis added, “When it comes to design, tire manufacturers have to look at industry trends. 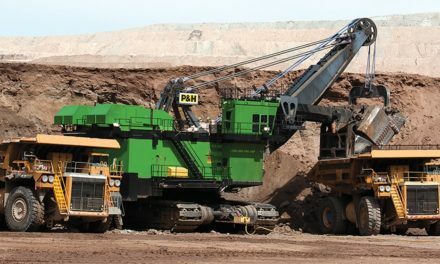 Mines never shrink—they’re always getting larger, and so are earthmovers, and that means we have to pay constant attention to compounds and other design elements that can stand up to longer hauls, higher speeds and temperatures, and bigger loads. The company currently offers LSW tire models for loaders and articulated dump trucks, and has plans to expand the product line to include more sizes for wheel loaders and haul trucks. Francis said Titan’s LSW loader tires, with lower profile and increased wheel size, improve stability and reduce recoil and bouncing associated with the larger sidewall of standard tires. The design results in five primary benefits—increased bucket loads due to less machine sway and resulting material loss; smoother ride and less bouncing on bumpy terrain; increased lateral stability around curves and hillside conditions; improved handling and improved breakout force. 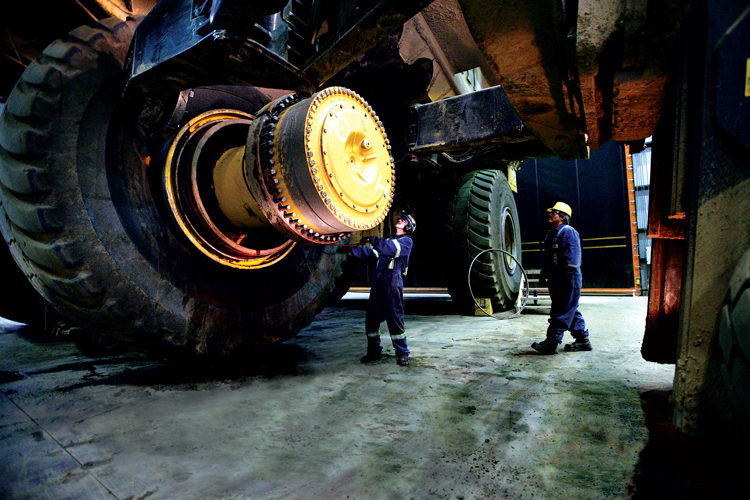 No matter what specific application giant tires are designed to serve, their cost, size and weight generally demand an overall higher level of attention than most other mining consumables—due in no small part to the risk of worker injury, equipment downtime and other adverse results when a tire fails or isn’t handled correctly. Anyone who has witnessed a giant tire explosion—whether in person or, preferably, on video—generally comes away with wide-eyed respect for the destructive force generated by these incidents, in which tires and wheel components can be hurled hundreds of feet away and adjacent portions of the vehicle heavily damaged or demolished. When equipment is struck by lightning or comes into contact with a transmission line, electrical energy goes to ground through the tires—the path of least resistance being the ply cords, which are typically steel. The surge of electricity through the cord material creates heat that can weaken the bond between the ply and the surrounding rubber. Because an inflated tire and wheel assembly is actually a pressure vessel, any compromise of the integrity of the vessel could lead to a catastrophic event. Heat resulting from these types of incidents causes expansion of the gases and can turn any moisture inside the assembly into steam, which can very quickly increase internal pressure beyond the capacity of the wheel or the now-damaged tire. Ron Tatlock, BKT’s manager of OTR training and engineering, told E&MJ’s sister magazine Coal Age (See The Right Safety Alignment, pp. 54–57, June 2015) that heat from electrification can initiate the process of pyrolysis, an exothermic (heat generating) process that breaks down the chemical bonds in the tire’s rubber compounds. Pyrolysis speeds decomposition and heats up gas and moisture present in the tire and wheel assembly, causing an exponential rise in internal pressure. In case of an electrification incident, BKT’s safety expert recommends immediately removing all personnel from the vicinity of the damaged equipment and creating a wide safety barrier around it, because tires, wheels and hubs have been found hundreds of feet away from the vehicle site following explosions. Then, keep everyone away from the vehicle for at least 24 hours. Although tire explosions typically occur soon after the causative incident, historically, there have been reports of catastrophic, explosive failure of large tires more than 21 hours following electrical contact, and this has been tied to pyrolysis. Finally, make sure all tires on the equipment are scrapped. Even if they look okay, Tatlock noted, they may still have chemical bond damage that cannot be seen. Deflating a tire will not prevent an explosion result from pyrolysis. Inflation pressure is not an essential ingredient in the pyrolysis process. Removing the energy source (live wire, etc.) will not immediately eliminate the risk of an explosion. In July, Michelin Earthmover unveiled a new mining tire for 250-ton-class rigid haulers that it claims can increase hauling productivity at least 24% compared with its 40.00 R 57 XDR2 model, based on tmph (ton miles per hour). The new XDR250 50/80R57 giant mining tire was developed to fit Caterpillar 793F and Komatsu 830E AC models and features significant technical improvements such as greater load capacity, lower operating temperature, faster driving speed, higher level of performance for improved productivity and longer life cycle when compared with the 40.00 R 57 XDR 2 tire. To match the growing capacity of rigid-body mining haulers, the XDR250 contains an additional 9.2% in air volume. Jamey Fish, director of earthmover marketing for Michelin North America, pointed out that the new tire carries a 67-ton nominal load capacity at a faster speed with a longer life cycle. In addition to a load capacity that’s 11.6% greater than its predecessor, the XDR250 has a new tread pattern that incorporates smaller rubber blocks crossed by grooves that optimize air flow and cooling. The tire runs 17° cooler in the crown, allowing it to carry a heavier load at the same speed or to increase average operating speed. The new XDR250 is factory-ready for Michelin’s MEMS tire monitoring system, which provides mining operations managers with real-time data about tire temperature and pressure conditions. Originally launched in 2006, Michelin said MEMS is currently used on more than 1,400 rigid dump trucks in nine countries and in 35 mines around the world. MEMS Evolution3, introduced in August, is the latest version. Using the next-generation tire pressure monitoring system (TPMS) sensor and improved system software, Evolution3 sends critical tire-related data and alerts to operators via various communication channel options. When tire temperatures change, the operator is alerted to the situation, allowing for a possible routing change to decrease failure risk. Monitoring also allows avoidance of unscheduled downtime through early detection of slow leaks. Advanced reporting capabilities monitor tire metrics. MEMS Evolution3 is available for rigid-body trucks fitted with tires having a diameter of 49 in. and greater, up to 12 tires per vehicle. Michelin XDR2 and Michelin XDR250 tires are pre-equipped for MEMS Evolution3 with a factory-integrated patch allowing rapid installation of MEMS sensors in non-liquid filled tires. Online preconfigured reports to provide transparency and consistency. Iowa Mold Tooling’s TireHand tire manipulators are featured on a new series of heavy-duty Hyster tire handling trucks. Kal Tire’s TTT vehicle kit has also been upgraded so data is visible to operators on an optional in-cab display. TTT constantly monitors the pressure and temperature of mining tires using a sensor patch mounted inside the tire. The sensor is sealed in polyurethane, keeping it accurate and waterproof in tires with liquid additives as well as durable enough for hot and humid temperatures. An antenna sensor mounted under the truck sends data as well as alerts. Managers have easy access to monthly reports and tire technicians receive instant, paperless tire maintenance work orders. 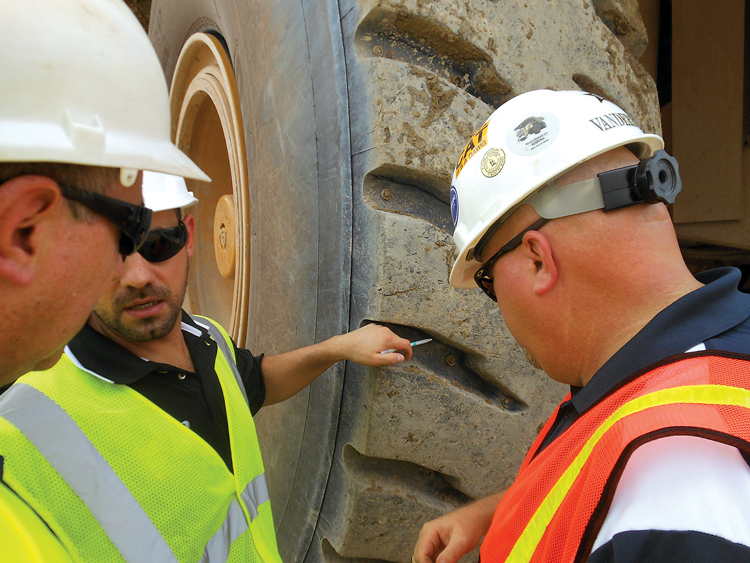 Mining tire and wheel repair/replacement has always been a risky procedure, involving components that often weigh several tons, have less than stable balance characteristics when unmounted, and require workers to be in close proximity to these hazards. 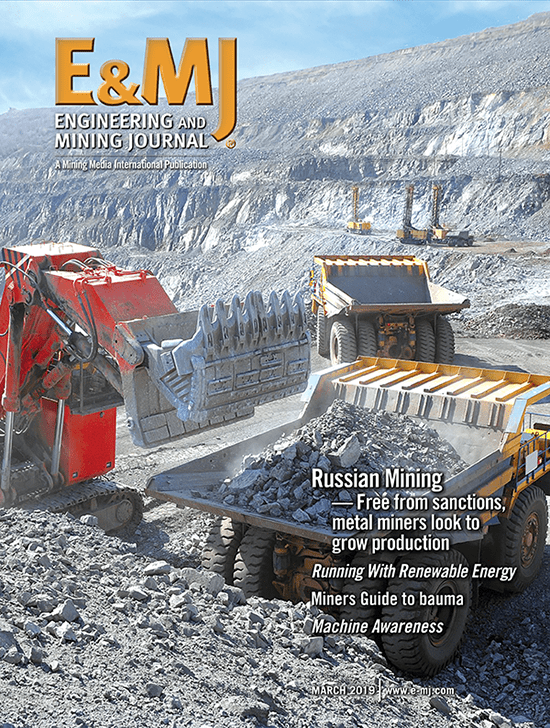 The latest tire-handling equipment is designed to remove as many of the risks as possible, and at least one of the world’s largest mining companies is looking at ways to remove workers from the equation almost completely, assigning the duties to autonomous machinery. 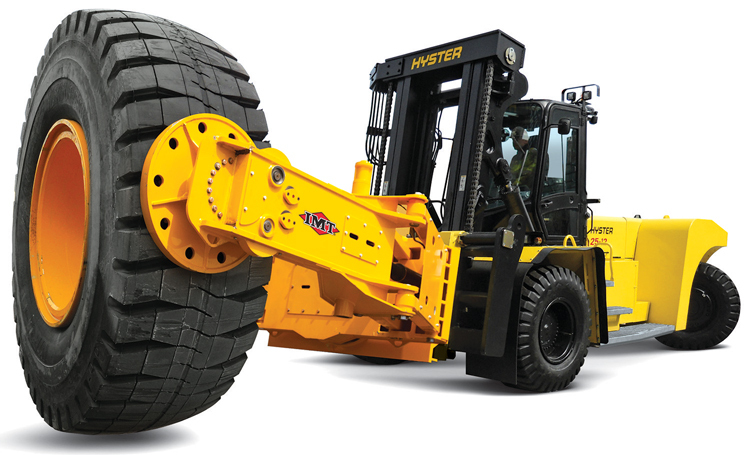 As an example of improved conventional equipment, Iowa Mold Tooling’s TireHand tire manipulators are now featured on a new series of heavy-duty Hyster tire handling trucks. Eight IMT TireHand-equipped units are integral configurations ranging from 5,000 to 36,000 lb (2,270–16,330 kg) of capacity for dedicated tire handling. Six others in the line have hang-on quick connect IMT TireHand attachments for flexible transition between tire handling and forklift modes. Also offering a full range of tire handling capacities from 5,000 to 36,000 lb, the new Hyster dual-function trucks with IMT TireHand tire manipulators can be reconfigured in less than an hour, according to the company. Hydraulically controlled fallback protection–IMT TireHand tire manipulators have integrated fallback protection arms for easy operation and operator safety. Optimized pad design–featuring an optimized grip pattern and tapering on the pad, IMT TireHand tire manipulators maintain their grip on the tire without damage and handle rim flange hardware with ease. Longer arm length–allows IMT TireHand models to reach the back flange on wheels. Minimized arm profile–arms are narrower to minimize interference with chassis components during tire handling operations. Dual pinion pad rotation–pad rotation utilizes two motors and two pinions, reducing pinion stress and extending pinion life. Rio Tinto is investigating the potential advantages of autonomous tire-changing equipment. Hyster trucks with IMT TireHand attachments are designed for all-around visibility of tire grab pads, fallback arms and wheel assemblies while providing enhanced rear visibility. A two-stage mast offers improved visibility of the tire handling application. At rated capacities, the Hyster tire handler trucks with TireHand manipulators are sized to provide tire handling solutions while consuming less fuel. 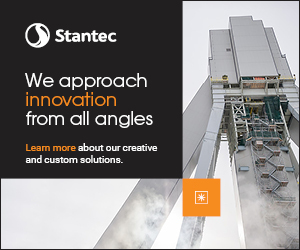 This results in lower acquisition costs and lower long-term operating costs. However, in the not-too-distant future, tire changing may be handled by a single employee using an iPad. Iron and copper producer Rio Tinto has, as part of its Mine of the Future innovation research program, been looking at autonomous tire changing for a few years now, and Andrew Harding, the company’s chief executive–iron ore for China, Korea and Japan, recently mentioned the concept during a speech at an Australian engineering conference. Noting that Rio Tinto’s autonomous truck fleet in the Pilbara has moved more than 200 million mt and covered a combined total distance of 3.9 million km, he remarked that the company was currently field testing a robotic haul-truck wheel changing system as part of an ongoing effort to improve worker safety and implement efficient, repeatable procedures that enhance productivity. 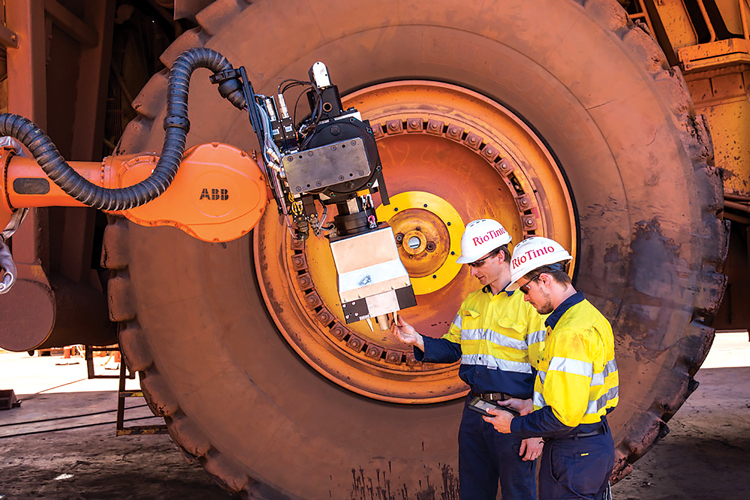 Robotic tire changing stations already exist; for example, New South Wales-based Machinery Automation & Robotics, which designs and manufactures complete automation and robotic solutions for various industrial sectors, has developed a Robotic Tire Change station consisting of a self-contained support structure equipped with manipulators to assist in the removal of mining truck wheels. Fitted with hydraulic tire clamps and hydraulic platform for smooth and safe wheel removal and replacement, the MAR unit claimed to be capable of mounting wheels onto hubs without damage to studs and hub faces. During the wheel removal process the MAR Robotic Tire Change employs scanning equipment to provide positions of the hubs, nuts, bolts and wedges. Automatically clamping the wheel for safety, the system’s nut runner tooling removes nuts and bolts, and a special tool is positioned to remove wedges if required. When ready, the unit engages its hydraulic platform to remove the wheel, and then accurately places the wheel back onto the hub and automatically replaces, tightens and torques nuts, bolts and wedges, as required. According to the company, the Robotic Tire Change system has the ability to provide assistance to all tasks related to attaching and re-attaching tire and rim combinations, with options for removal of tires with quick-change options.